One of the most romantic images of all time shows a man down on bended knee while presenting an engagement ring to the woman of his dreams. This is probably a scene straight from a 1950s movie because surveys show that today many women feel they would rather choose the ring they will be wearing for a long time. This practical view has become more and more popular in recent times, and it has posed a dilemma for many hopeful men who want to uphold the tradition of buying a ring and presenting it, fait accompli, to their girlfriends. They think it looks good. They think their girlfriend will like it. They think it will fit the personality of their girlfriend. The design and the stone have some significance to them as individuals. It falls within their budget. In return for their efforts, men expect their proposal to be met with a happy “yes”, and their ring to be received with appreciative wonder. The practice is meant to show the strength of a man’s feelings and the firmness of his resolve in committing his life to this one woman. Although it is not an idea that sits well with all modern women, some couples believe there is merit in allowing men to pick the diamond ring they will propose with. Mainly, traditionalists think it obliges a man to go through a lot of trouble before he can pop the question, the kind of effort that is seen less and less today. Letting men pick the ring on their own can yield some good results. It puts men in a situation where they have to exercise their investigative skills and their resourcefulness. Everything comes easy for most men in man-woman relationships today, but when a man chooses something like an engagement ring with side stones, he first has to sweat a little. He has to discover his girlfriend’s ring size, and he has to somehow find out what type of ring she would be happy to wear. Then he has to plan how he will propose. All things considered, it is probably one of the most challenging things he will ever do for the relationship. 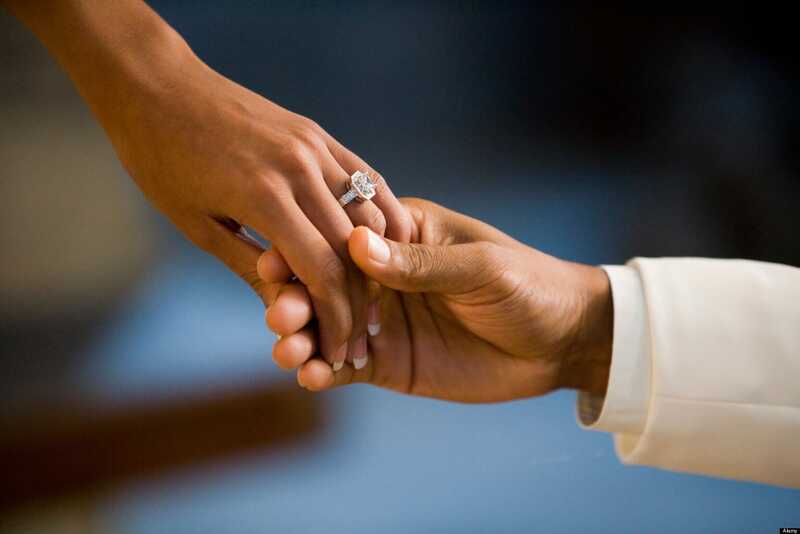 It puts women in a position where they realize how accepting a man’s proposal means accepting him – warts and all. This starts with appreciating his ring, no matter how much more beautiful the other diamond rings in the store’s shelf might have been. A lot of women still want to be surprised with a ring that a man chose; the proposal it comes with is well worth the risk of ending up with a ring they wouldn’t have picked. However, for others, the proposal is enough of a thrill and they want to make sure that the ring they end up with is not atrocious. This is just one of the reasons why women want to have a say in their engagement ring and their wedding ring – and a recent survey showed that more than 50% of the women interviewed felt this way. There are many reasons for foregoing the traditional image of receiving the ring along with the proposal. They want a ring they can use happily not just for romantic but also for aesthetic reasons. They want a ring that looks good to them and on them. This may not always be possible when someone else chooses the ring. After all, choosing diamond rings is not exactly known as a male forte, and little design details (such as how high the stone should be set) often escape notice when an unaccustomed eye is making the selection. Different people have different tastes, and this often means they prefer different jewelry styles. Because of this, some will say they would rather have some input in picking a ring that will hopefully be on their finger all their lives. As one woman put it, she would trust her husband with her life and her whole future, but that doesn’t necessarily mean they will like the same ring. Some women want to play an active role in picking their ring because this makes them feel respected; it makes them feel that their opinion matters. This option implies that the ring will come after the proposal. For them, going through scores of trays together to find the perfect solitaire engagement ring will be a joint adventure, a joyful exercise in compromise. Many men really do want to go through the whole ceremony of staging a surprise proposal complete with a beautiful ring, but many refrain from creating this romantic setting for some very valid reasons. They don’t trust their ability to get the ring that will be liked. Some men know that they just don’t do well with things like choosing rings – regardless of how much they love the woman they are proposing to. Some men have absolutely no idea what their girlfriends will like, but there are some ways to deal with this problem. Some investigate until they have enough information, while some will take a gamble that the ring they pick will be received well. The rest cave in and ask the girl to choose. There are men who really want their girlfriends to have just the ring they want. After buying wedding rings, paying for wedding expenses, and dealing with the cost of settling into married life, they know it might be a while before there is spare money for another gift in the same scale. It becomes doubly important that the ring be exactly as the bride-to-be wants it. There are two sides to the issue of whether a woman should have a say in choosing her engagement ring: one side says tradition dictates the man buys it and presents the ring when he proposes, but the other side says since she is wearing the ring, she should get to choose it. If you find yourself in this situation, there are ways to navigate through this concern for a win-win ending. If you are thinking of going through the whole on-bended-knee-with-ring-in-hand routine, learn to lead the conversation to rings, and pay attention to what she says. Start a conversation with something catchy like; Do you know Jackie Kennedy had her emerald engagement ring reset? Imagine that!” Her answer ought to enlighten you. 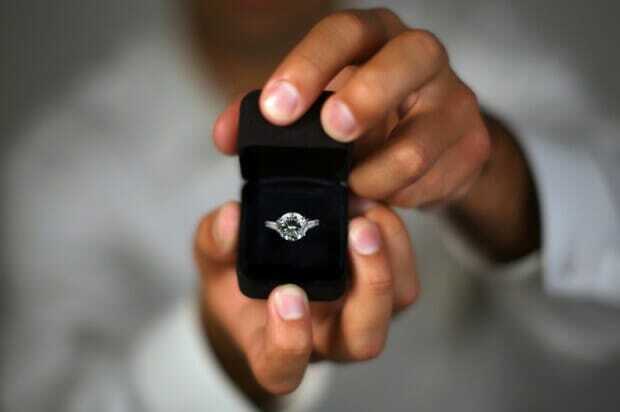 Ask her best friend to give you her ring size, the type of precious metal she wants, and the cut of the center stone. You also need to have at least a general idea of her preference in style. She may actually not want an elaborate or bulky piece; some women actually like the idea of getting a flat ring that won’t snag (such as a white gold eternity ring because that suits their lifestyle better. There are ways for women to have a say in what their ring will be like without spoiling the “surprise” element of a proposal. If you know your boyfriend wants to get you a ring, begin to drop hints about the kind of ring you want. Sometimes your hints have to be clear so plan and practice. Tell him stories about the divine ring so-and-so got (“Such a pretty, white gold solitaire with a princess cut stone!”) and tell him you and your girlfriend went window shopping and both of you liked this ring which had a nice brilliant center stone. If he still seems to be clueless, get a free catalogue from the jewelry story you like, turn the page to where you see the ring of your choice, and encircle the picture in red. Leave that catalogue open on the coffee table for him to see. Now, if he still doesn’t get it, you can just go ahead and tell him what you want. If you would rather not be this direct, you will need to accept whatever ring he will choose. Remember that after all, the most important thing in your relationship is your love for each other. This may include letting him express his love with whatever ring he chooses.